What is the Most Popular Outdoor Activity in the US? How do you entertain 16 children with diverse backgrounds for 2 hours without a single complaint? Take them fishing of course! What a catch! Me and my wife teaching kids how to fish. Recreational fishing is currently the most popular outdoor activity in the country according to a recent report, even surpassing running, camping, hiking, and biking. Despite being incredibly popular, a sharp decline was seen in the number of anglers in the US from 52 million (2007) to 45 million (2010), giving worry that declines would continue. Thankfully, 2011 broke the downward trend with a rise to 46 million anglers, indicating that 16.2% of the population went fishing last year! Apparently worms attract more than fish. Previous declines in the number of anglers were attributed to urbanization, interest in other activities, and increased fishing costs. With fishing’s recent gain in popularity, it is important to understand what made 2011 different so that we can continue to maintain increased interest. 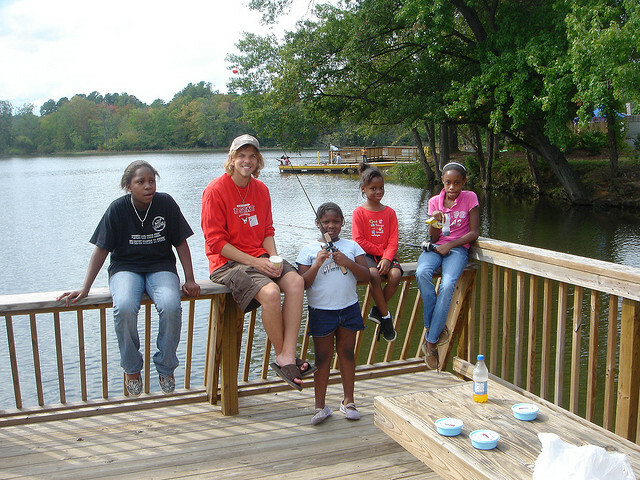 A recent fishing event where college students taught children how to fish. To buck the downward trend in the number of anglers, fisheries professionals employed a lesson out of the Business Handbook: Recruit underrepresented groups. Fishing demographics are dominated by Caucasian males, with only 3 of 10 anglers being female, and 2 out of 10 being non-Caucasian. These underrepresented groups must be introduced to fishing if the activity is to ultimately rise in popularity. Accordingly, the most recent cohort of new anglers demonstrated strong increases in women and non-Caucasian participation, contributing greatly to the overall increase in anglers for 2011. 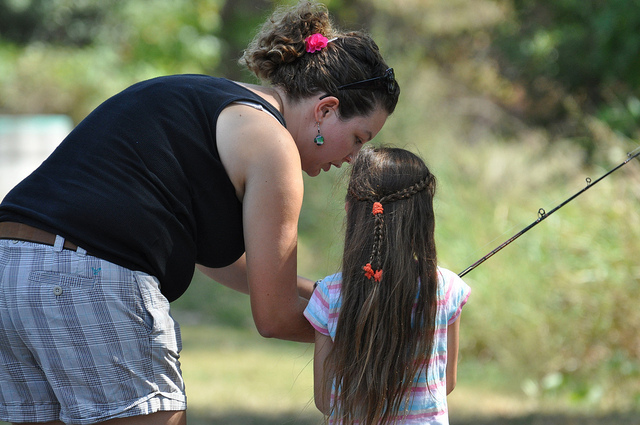 Women and girls contributed greatly to the increase in anglers for 2011! 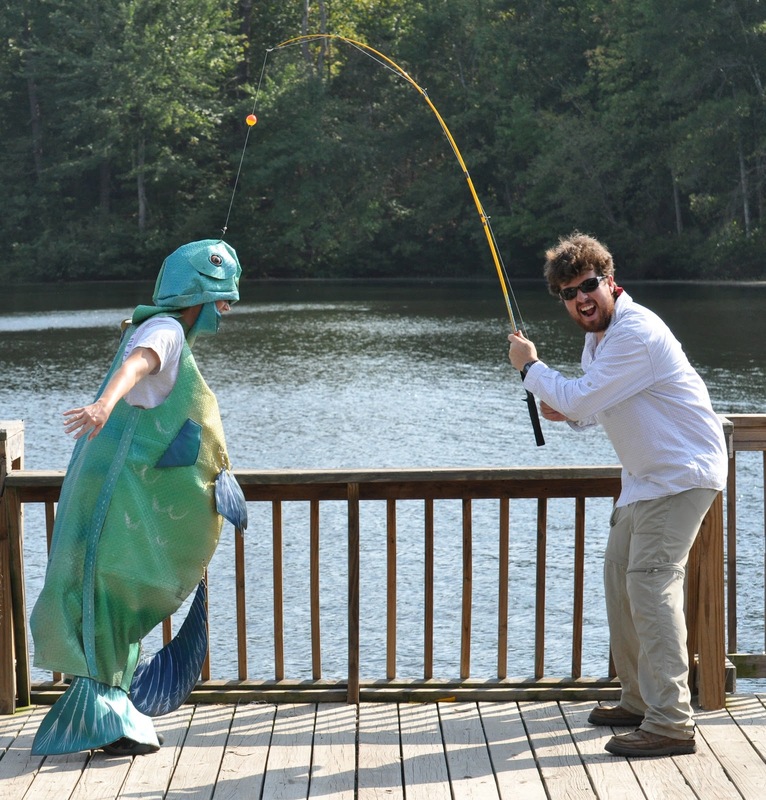 A local nature museum is contributing significantly to the rise in diversity of anglers. They recently approached me asking if I would take a diverse group of 16 kids fishing. I enjoy teaching people how to fish, but I worried that with the recent heat wave, the bite would be slow. 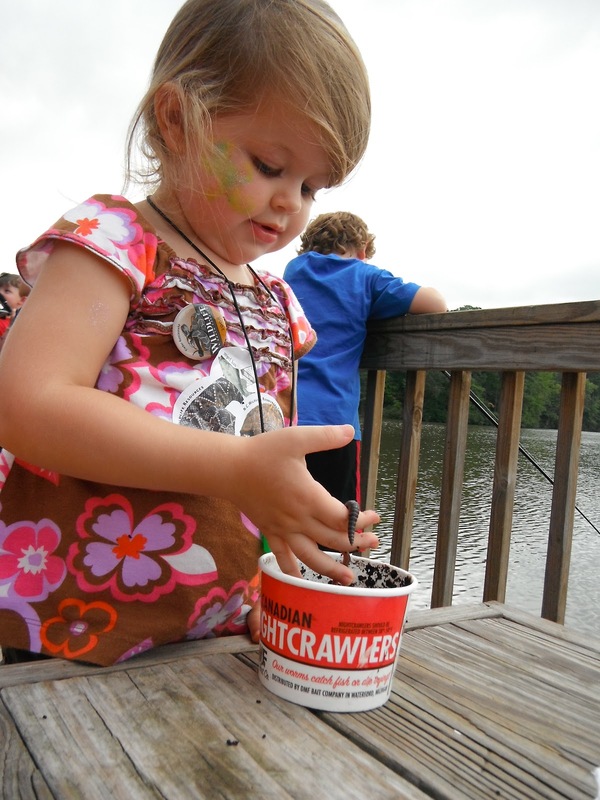 In my previous experiences, low catch rates have diminished my ability to convey to children that fishing is a great way to get outside and enjoy nature. But, my drive to introduce kids to fishing far outweighed any worries. 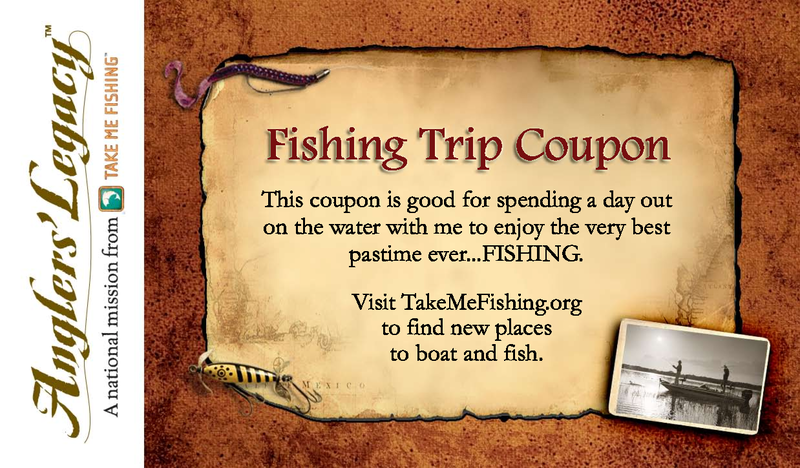 Be part of the upward trend: give the gift of time and fishing. My worries of slow catch rates evaporated immediately as the fish cooperated and came over the rails so fast I could hardly keep up with baiting hooks and removing fish from lines. Of the group, 25% had never fished before. Providing a little more instruction and encouragement to these novices, combined with pairing them alongside more experienced children, yielded incredible results. 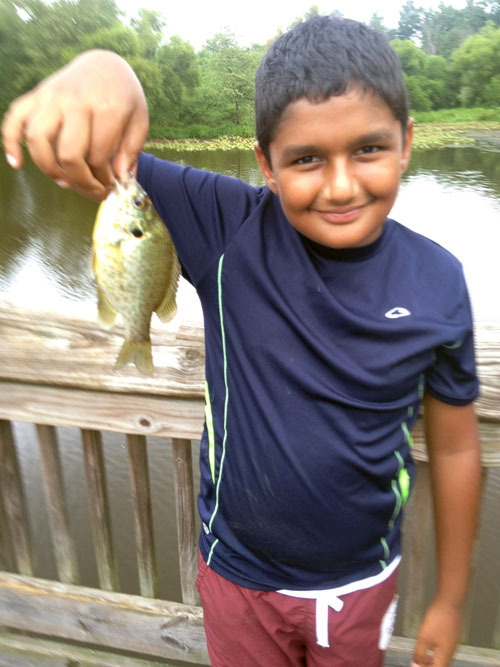 Every child caught multiple fish, leaving smiles on faces and confidence in their abilities. The following quotes came from first time anglers confirming that although the effort was small, the reward was huge! 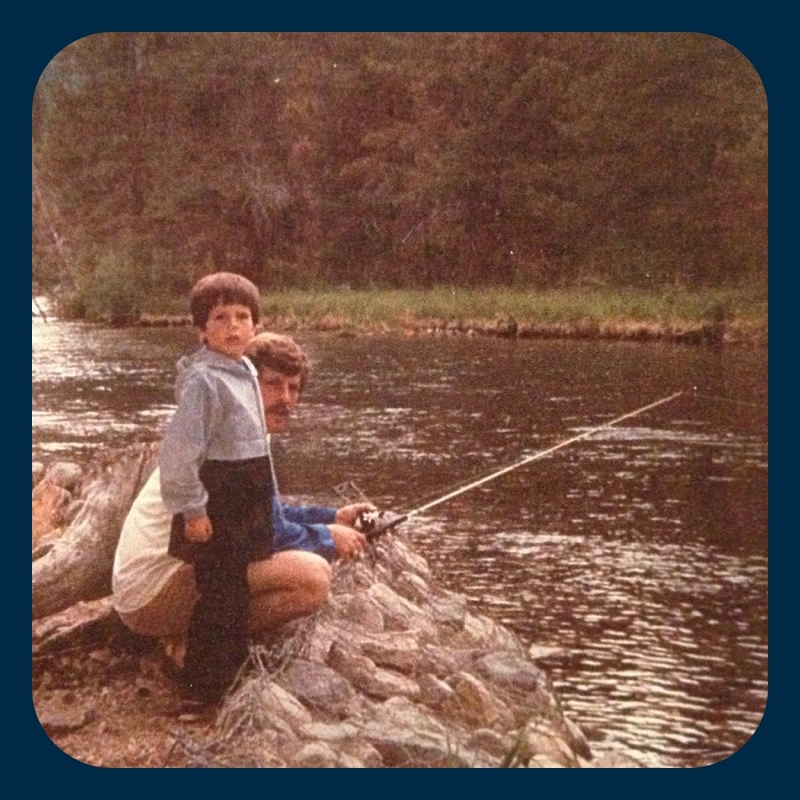 I can still remember this exact day of fishing from 25 years ago. 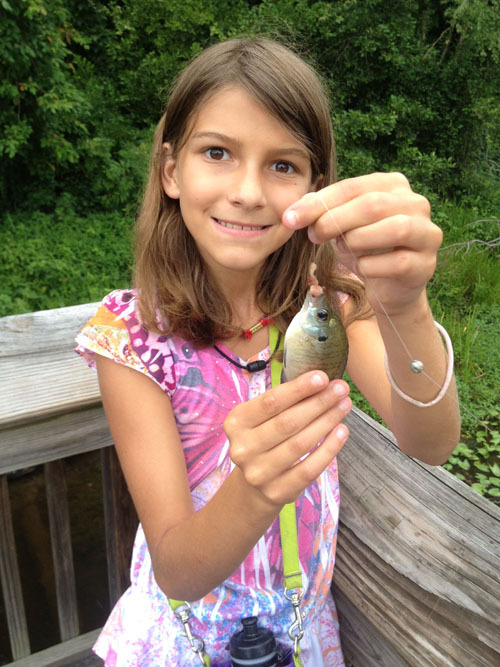 We challenge our readers to collectively take at least 50 Kids Fishing by the end of the year! 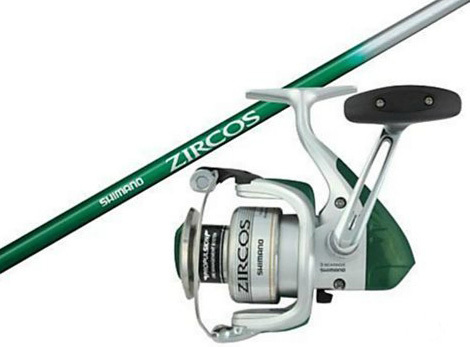 If this goal is reached, The Fisheries Blog will reward one person (by random drawing of comments from those who took kids fishing) with a Shimano Zircos Rod and Reel Combo with a regular retail price of $80. 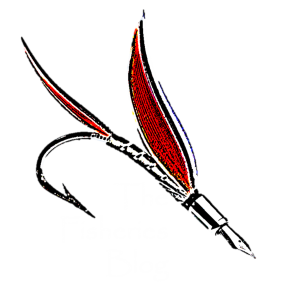 Please check in weekly to The Fisheries Blog to keep track of the total and to see if you are the one to be rewarded, and feel free to pass this to your friends, post to Social Media, and share the word about taking kids fishing. Watch a friend’s kid catch his first fish ever. Wait for the surprise ending! Previous Post What Do Las Vegas and Coral Reefs Have in Common? UF's Students United in Research of Fisheries has been working with at-risk youth in Alachua County Schools. Currently this summer, we have taken out 35 kids from Lincoln middle school, 20 kids from Hawthorne, 19 kids from Mebane and tomorrow we will be taking out 30-40 kids from Howard Bishop. Many of them have caught their first fish ever! Some bass, mostly bluegill. We have several photos and have been collecting data on length, weight and age (estimated by grad students) so the kids can plot them all up on X-Y scatter plots. As one of the founding members of SURF, I am proud to hear that the tradition of taking kids fishing is still a huge priority! Congrats to you and the rest of the SURF crew. Be sure to have others who have taken kids fishing come on here and make a comment so that they have a shot at the rod and reel as well. Thank you! We are hopeful to inspire others to take kids fishing. Great article and challenge Fisheries Blog! I've helped with a few fishing events this year, but taking my nephew Kaden to Lake Johnson where he caught his first (and then a bunch more) fish was definitely a major highlight that I will always remember. Excellent work Josh! That video was so great, I embedded it into the blog post above. Spread the word, and let's get people out fishing with kids. Excellent article that brings hope to those in the fishing industry. If employing a catch-and-release method, recreational fishing will be around for a long time to come. You are so right about introducing underserved individuals to the industry. Fishing is a great pasttime that can great fun! Thaat is a very good tip particularly too those new to the blogosphere.